Fixed-price listings have become the dominant strategic format at eBay in recent years, and for a good reason: When you're being surrounded by online retail, it's a losing proposition to offer only complicated auction formats marred by a high learning curve and lots of complications that aren't seen, for example, at Amazon. Though eBay is still often imagined by many as an auction house, the perception is gradually changing. Even as fixed-price listings grow in dominance and popularity, however, there are things that many don't know about them. eBay didn't always have fixed-price listings. In fact, eBay was already a relatively large success in the early dot-com era and beyond before adding the "Buy It Now" feature, which would later become known as the fixed-price listing. They also paid the price: another company held a business process patent on the feature, and eBay ultimately paid to acquire it to be able to use it and offer the chance to "buy it now" to eBay shoppers. First and foremost, for those that haven't been to eBay recently, the dominance of the fixed-price listing has made eBay much more similar to other online retailers than it once was. You go, you add an item to your cart, you check out, it arrives shortly after that. If you haven't shopped eBay since this came about, try it. If you're an "eBay changes complainer," keep in mind that without this shift, eBay may have gone the way of the dodo as the mass of general consumers flocked to eBay's competitors. Of course, the name of eBay's game has always been the flexibility that it offers over traditional retail, and in this sense, eBay's fixed-price listings are special: They can also be auctions. When listing item(s), a seller can opt to create a listing that is both an auction and that also has a fixed price. If a customer comes along and makes the purchase at a fixed price, the auction stuff is irrelevant. If a customer comes along and places a low bid instead, the fixed price disappears, and the listing becomes an auction, open to bids by all. Best of both worlds. eBay fixed-price listings also differ from those on Amazon in that sellers can decide to allow haggling with buyers using the best offer feature. This gives sellers additional flexibility to balance desired margins with marketplace realities. Given the trifecta of the auction, fixed price listing, and best offer feature, eBay remains the most flexible marketplace online for buyers and sellers alike, and that's one of the reasons it continues to thrive. There's a perception that every item listed for sale on eBay is a kind of island; every item gets a listing, making eBay more like classifieds than a retailer. In fact, sellers can offer many instances of the same item with a single listing, and eBay then collects listings for identical items from many sellers and aggregates them into single catalog pages for items. The net effect is that eBay has managed to turn its marketplace into something that works very much like the more traditional retailers online, something that has been instrumental in its turnaround. While auction format listings can be posted in 1, 3, 5, 7, or 10-day durations, fixed-price listings can also be posted in 30-day or active-until-stock-runs-out durations by sellers and placed in eBay stores. The net effect of this difference has been to direct professional sellers and small retail businesses toward fixed-price listings, where this kind of convenience becomes logistically important, and to direct individual one-off and used-goods sellers toward auction-format listings. At least in recent months and years, more of the promotions offered by eBay have been discounts on the insertion fees for auction-format listings than for fixed-price format listings. As a result, fixed-price listings have become something of the "premium" format on eBay, auction-format listings more akin to the "discount" format, something that reflects their returns (see below). Though there have been no prominent studies of this effect and eBay hasn't commented on it, many sellers and observers have suggested that in recent years it's become clear that auction format listings result in lower margins than fixed-price listings. This is probably due to a mix of the lower visibility of auction format listings and the growing perception that fixed-price goods are the "retail" goods while auction goods are the "discount" goods amongst consumers. Because auction format listings are shorter and their value is dependent on participation volume from buyers, and because sellers have less input into their final values, they're much more subject to timing effects and other marketplace fluctuations. For bookkeeping and planning purposes, it's much easier to manage fixed-price listings and measure performance regarding sell-through rate rather than average selling price. For sellers, deadbeat bidders have long been one of the primary arguments against eBay. Deadbeat bidders purchase an item (either by bidding on an auction or by "agreeing" to buy a fixed-price listing), then disappear from the radar without ever paying for it, costing the seller headaches, fees and delays. In fact, eBay rectified this state of affairs for fixed-price sellers some time ago. Sellers of fixed-price items can now require "immediate payment" for items. 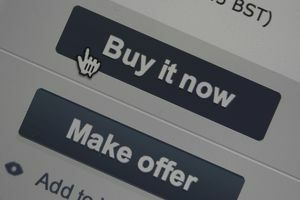 Until the buyer has paid, the item remains on sale, another change bringing eBay closer to a traditional retail house. With the online retail landscape shifting ever more toward mobile and the online retail space continually growing, the fixed-price format is here to stay and promises to play a large part in eBay's evolution in the future. Whether or not eBay remains an "auction house" indefinitely, it will likely be a "fixed price" marketplace, if nothing else, until the day it dies.